Daifuku (大福: literally "great luck") is a traditional Japanese confectionery (和菓子 wagashi). It is a mochi (glutinous rice cake) stuffed with anko (azuki - red bean paste). 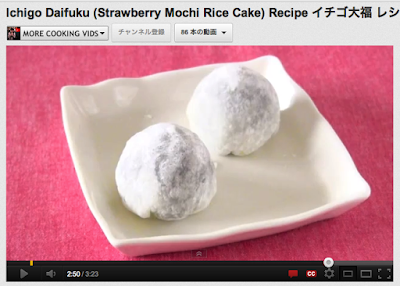 Ichigo (strawberry) daifuku is a rice cake with strawberry and red bean paste filling. 1. Divide Tsubu-An (red bean paste with skin of beans) into 6 portions and wrap the strawberries. 2. Put Kiri-Mochi, sugar, and water in a microwavable glass container. Lightly cover with plastic wrap and microwave for 3 minutes at 500w. 3. When the mochi is done, use wooden spatula or rice paddle and knead. Lift up and mix until water dissolves. 4. Place Mochitoriko flour in a flat container, dust the mochi and divide it into 6 portions. 5. Flatten down a piece of mochi, put the bean paste in the center, and pinch to close. Microwaved mochi gets hard quickly, so eat as soon as you make!! !